An exposed staple in the sole of the boot presents a laceration hazard to the consumer. This recall involves about 5,000 Autumn Run brand girls Gemma II style boots with SKU number 0529-02613-1050. The SKU number can be found on a tag which is located inside the shoe, on the inner side of the collar. The brown roper style boots were sold in girls sizes 5 to 11. 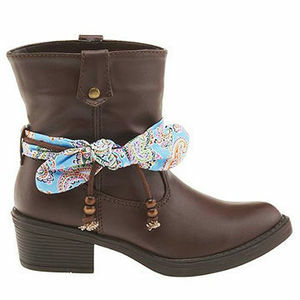 A paisley-print fabric sash and a leather beaded strap are tied around the boot. Renaissance Imports has received one report of a consumer who was punctured by an exposed staple in the sole. Academy Sports + Outdoors stores nationwide and online at Academy.com between July 2012 and October 2012 for about $23. Immediately take the recalled boots from children and inspect the boots for exposed staples. Instructions for inspecting the boots can be found online at renimp.com. Boots that are stamped "INSPECTED" on the reverse side of the inside label have been inspected for staples and are not included in this recall. Consumers can return recalled boots to any Academy Sports + Outdoors store for a full refund. For more information, call the company at (877) 632-2021 or go online to renimp.com and click on "Product Recall Info." Renaissance Imports toll-free at (877) 632-2021 from 9 a.m. to 6 p.m. CT Monday through Friday, or online at www.renimp.com and click on “Product Recall Info” for more information.